This was the first Thanksgiving I have spent with my parents since I got married, and the first time I have used their split oven to cook a feast. It definitely saved me some planning and compromise in that last crucial hour, but I still split up the work over Wednesday and Thursday, getting the majority of the baking out of the way early. One of the big projects for Wednesday was bread-baking. I always have some sort of fresh bread on hand at Thanksgiving, and this year I did challah because my mom loves it. I made a double recipe based on the one here, and baked up a panful of knotted rolls together with a braided loaf shaped in a 9×5 loaf pan for slicing. My only adjustment besides doubling the recipe was the inclusion of about 33% whole wheat flour (some sprouted). It rose volcanically in my dehydrator for the first rise, less than an hour to overflowing the bowl, so I gave it a second rise before shaping. 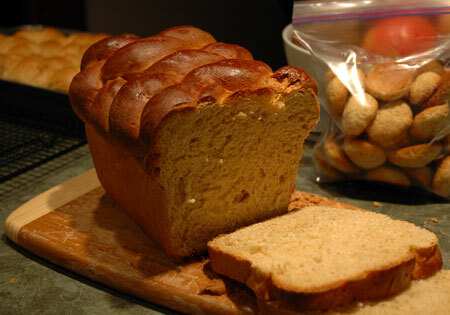 The texture of the finished bread was perfect: light and fluffy with just a touch of crispness in the crust. If this recipe didn’t leave so many orphaned egg whites, I would consider adapting it for our everyday loaf! Several cups worth of bread cubes spent the night on a drying rack so they would be sufficiently stale to incorporate into the stuffing. In the photo above, you can also see the cookies I baked on Wednesday. They are Alton Brown’s vanilla wafer cookies, prepared in advance of a crumb crust for pie, and although they didn’t look like the store-bought sort, the flavor and texture was right on, and the amount would have been just right for two pies if we hadn’t done some snacking (whoops!). I always have a soup course as part of Thanksgiving dinner, but because I don’t rush things to achieve an early meal time, the soup generally works out best as lunch. This year I moved it up even further, to dinner on Wednesday night. As long as I was roasting a pumpkin for pie, I went ahead and threw in a small butternut squash from basement storage, and the latter became this creamy soup, fragrant with ginger and fennel and swirled with hazelnut cider cream. The finished product is something of a hybrid between two recipes, and I was very pleased with its complex but mildly sweet flavor, despite an abiding dislike of both squash and fennel. We attended a Thanksgiving service and pie social at our church on Wednesday evening, so I made sure to build in time for baking pie. 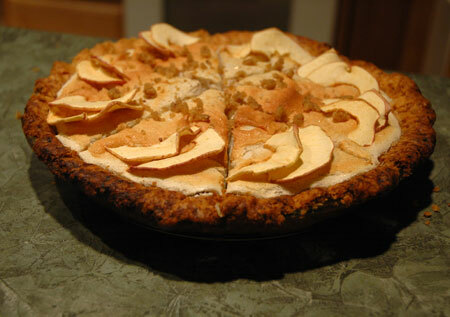 Hoping to be unique, this is the apple cider cream pie from Food & Wine, topped with a rather limp chestnut meringue and slices of our own dried apples. I opted for a meringue top even though it isn’t my favorite, because I had a bunch of egg whites to spare after the challah dough, and I think the ground sweetened chestnuts weighed down the meringue with their oil content. Oh well, the single bite I was able to sneak tasted alright, and I think it was very pretty. The last few cups of meringue had so little lift that I gave up trying to put it on the pie and folded in sifted flour to make some little chestnut genoise cakes, baked in 6″ tart pans. They baked up just fine, and tasted delicious and moist between layers of leftover eggnog buttercream from a banana cake my mom made last week. Then on to the main event! This year we had a 12-pound organic turkey to work with; as much as I would have loved to get a heritage-breed pastured turkey, we just could not justify the price. I selected a Jonathan Waxman recipe for the turkey this year, a sage-brined affair with a side of wild rice and oyster stuffing. The turkey spent the night before its big debut in a cooler in our garage, soaking up the sage-infused brine (it took almost two recipes of brine to cover the turkey because of the size of our cooler, unfortunately; that is a lot of water dripping through our little Brita filter). It went in the oven on Thursday, stuffed with onions and celery and turned breast-side down for the first hour and a half. I have never used the upside-down roasting technique before because I worried about the logistics of flipping a searing hot bird, but I decided to trust the Jedi chef on this one and successfully used paper towels to use the wings as handles, tearing the skin only minimally in the process. 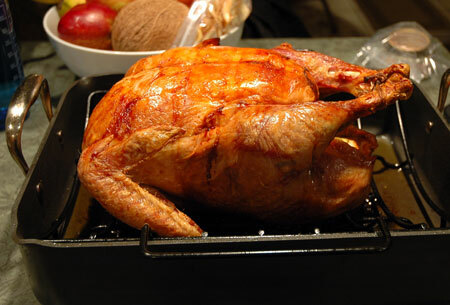 We ended up with a perfectly browned and crisp exterior and beautifully juicy meat, as delicious a turkey as I have ever tasted, no fussing about under the skin with compound butter required! Here is the finished plate: perfect slices of turkey with my signature gravy, oyster stuffing and brown butter mashed potatoes, roasted Brussels sprouts with walnut cream and pomegranate, green beans with chestnuts and date vinaigrette, challah knot roll, and apple-cranberry sauce. None of the recipes I selected were out there in terms of non-traditional flavors, but they were all new to us, and I thought they complimented each other nicely. The oyster stuffing was very good, with the chopped oysters themselves disappearing into the savory background for a boost in zinc without activating my squeamish tendencies. The green beans were my least favorite side of the bunch, although they were still tasty, and the Brussels sprouts evolved from a plan calling for a dressing of capers, walnuts and anchovies to my own invention: walnut and garlic-infused cream reduction simply tossed with roasted sprouts, toasted walnuts, and pomegranate arils. 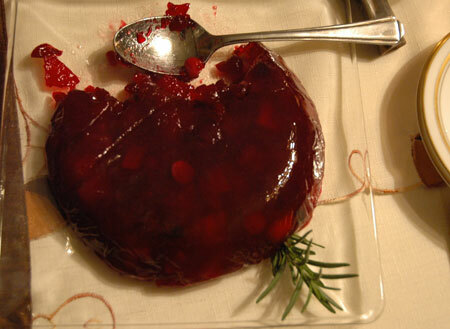 Aside from the turkey itself, the homemade cranberry jelly was my dark horse winner this year. I don’t really like cranberries or cranberry sauce—they are too sour for me in general, and cranberry sauce is either too gelatinous or too chunky. I always make some version of it for the rest of my family, however, and this year was no exception. I tried a very simple jellied recipe that combines cranberries with diced Fuji apple; my only addition was a little vanilla extract. I also used about a cup less than the full 12-ounce bag of cranberries thanks to a cranberry-oat-ricotta muffin recipe. The dish set up in and released perfectly from its plastic wrap-lined bowl, and I actually thought it was delicious, flavorful and just sweet enough. Even the texture did not deter me from eating it right along with bites of turkey, which is a holiday miracle for my tastes! Finally, no Thanksgiving dinner is truly complete without pie. My mom made a pumpkin chiffon pie once before I was born, and my dad has been longing for a repeat of that blessed event ever since, so I decided to make one this year in his honor. 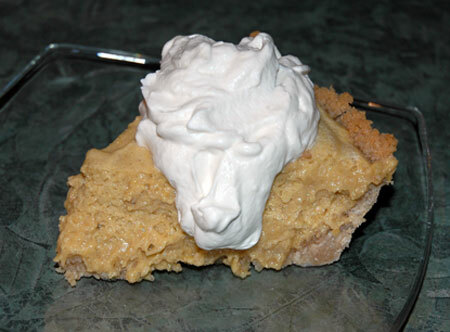 The vanilla wafers shown at the start of the post were the base of the crust for this pie, and the filling was a mixture of home-roasted pumpkin puree, heavy cream, a few choice spices, separated eggs with whipped whites, and my nemesis gelatin. Fortunately, the gelatin cooperated with me this time around and we ended up with a deep-dish pie and half a dozen muffin-cup mini-pies. Topped with a little lightly sweetened whipped cream (I actually found Organic Valley whipping cream labeled “pasture-raised” this year! ), this pie was light as air and absolutely perfect. My dad took one bite and declared it the equal of his 40-year old standard, and I thought the vanilla wafer crust was a nice change from the expected graham cracker or gingersnap variants. 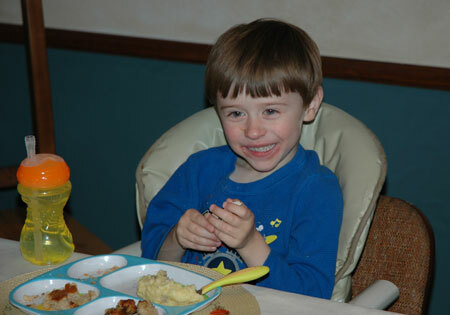 So what was the overall verdict for this year’s Thanksgiving dinner? The turkey was a sight to behold and even better to taste; Nolan ate a ton of turkey which is an incredible victory for my meat-deprived picky eater. He rejected the stuffing after a bite or two (probably too soft), but all the adults thought it was delicious; it did, however, make the biggest pile of stuffing I have ever seen, and we ended up sticking half of it in the freezer after dinner since I am not sure how well it will transform as leftovers. 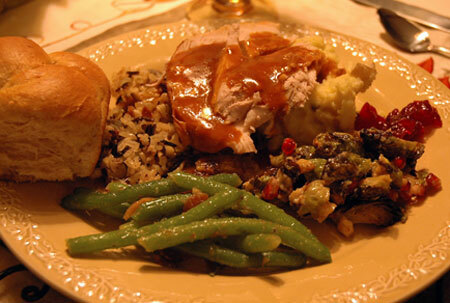 The vegetable sides were all solid, but the easy cranberry sauce stole the show for me. And that pumpkin chiffon pie will be going in our regular rotation. On with the leftover parade! Preheat the oven to 350°F. Rub the cut sides of the squash with the olive oil and set them, cut side down, on a large rimmed baking sheet. Bake the squash for about 1 hour, or until very tender. Remove from the oven and let stand until cool enough to handle. Spoon the squash flesh into a large bowl; discard the skins. In a large soup pot, melt the butter. Add the onion, fennel and ginger and cook over moderate heat until softened, about 8 minutes. Add the squash, 1 C apple cider and sherry vinegar; simmer until the cider has been absorbed. Pour in the chicken stock, add the thyme, nutmeg, and a good pinch of salt; cover and simmer for 20 minutes, stirring occasionally. Uncover the pot and continue cooking until the squash has completely fallen apart, about 10 minutes. Remove from the heat and stir in the heavy cream. Use a blender or stick blender to puree until very smooth; taste and adjust seasonings. Boil remaining 1/2 C apple cider in heavy small saucepan until reduced to 1/4 cup, about 5 minutes. Cool. Place sour cream in small bowl. Whisk in reduced cider, hazelnut oil and chopped hazelnuts. (Soup and cider cream can be made 1 day ahead. Cover separately and refrigerate.) 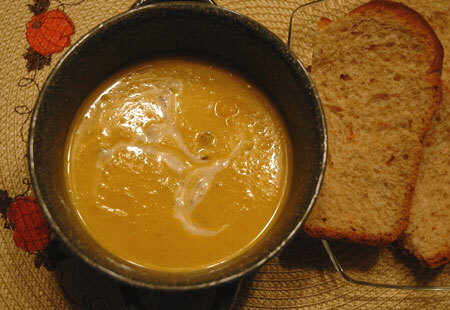 Serve the pureed soup with a dollop of cider cream in the center. Source: Adapted from Food and Wine and Epicurious. Line an 8×4″ loaf pan with plastic wrap and spray the plastic wrap with nonstick cooking spray. This recipe makes a heck of a lot more dirty dishes than the classic pumpkin pie, so be prepared. It is definitely worth the extra clean-up time though! Prepare the crust: Preheat oven to 400°F. In a large bowl, combine the cookie crumbs, butter, sugar and salt. Press mixture firmly into 2 9-inch pie pans (if you have any extra mixture left over, you can press this into muffin tins with great results). Bake for 10 minutes, and cool on a wire rack. Meanwhile, in a heavy saucepan, whisk together the pumpkin puree, heavy cream, and 1/2 C sugar, 3 egg yolks, the spices and salt, then turn on the heat to moderately low, cooking and stirring constantly with a wooden spatula for 10 minutes until just steaming. Transfer the mixture to a bowl, stir in the gelatin mixture, and let the mixture begin to cool. In a large bowl, beat 4 egg whites until they hold soft peaks. Beat in the remaining 1/3 cup sugar, 2 tablespoons at a time, until the meringue holds stiff peaks, and then fold it gently into the partially cooled pumpkin mixture. Assemble: Pour the filling into the baked shells and chill the pie, lightly covered, for at least 6 hours. Garnish with plenty of fresh whipped cream.